What do we know about free schools? Free schools are getting ready to begin the journey from policy idea to desks and pupils. But what do we know about these schools? The coalition government is now inviting applications, with the aim of opening the first wave of free schools in autumn 2011. During the election, the free schools policy was discussed in terms of parents setting up schools. But much of the initial interest seems to be coming from groups of teachers, wanting to use their skills and enthusiams in more challenging inner-city areas. About half of more than 700 expressions of interest are from teachers. This is also in keeping with the government's efforts to present the policy in terms of improving chances for the poorest families, rather than funding an escape route for middle class families from the local school system. Education Secretary Michael Gove has relentlessly identified the plan with the charter schools in the United States, with their "no excuses" message. There is also an emerging picture of where such schools are likely to be - with by far the largest concentration in London and the south east, with particular interest in west and south-west London. And while there might be teachers wanting to set up free schools, the teachers' unions are among the fiercest critics, saying they are a backdoor way of dismantling the state system. It remains much less clear how many of these schools will be opened. 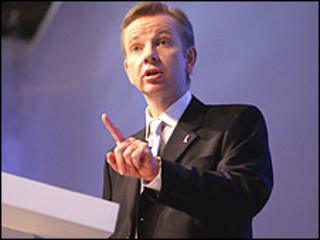 Mr Gove said there was no upper limit for places - or any target number to be achieved. As initial start-up funding, the government is allocating £50m with an unspecified larger amount to follow, but Mr Gove said there was no way of telling how this might translate into school numbers. This casts another shaft of light onto how these schools are going to be very different. Instead of big, bright, hi-tech new schools, where a single academy could cost £25m, these free schools could be smaller and thriftier arrangements. Planning rules are going to be changed so they can be set up in converted commercial or residential buildings. It's going to be more Little House on the Prairie than Star Trek, village schools on a budget in an inner-city setting. The message from the government is that ethos is more important than landmark buildings. They want to devolve control to local groups rather than local government planners. But this will raise questions about what kind of minimum facilities will be allowed in schools. How will they give pupils a wide enough range of subjects and experiences? These schools will have to comply with regulations on fair admissions - and plans for staffing and premises will have to show viability for at least five years. Many of the regulations for standard of education and policies on behaviour and child protection seem to have been adopted from those applying to the independent sector. In fact, all free schools will have to register as independent schools - while remaining as "maintained" schools in terms of funding. In terms of opening a free school, applicants will have to show there is demand from parents - and although there is no fixed threshold, Mr Gove says proposals should have the support of at least 40 to 50 parents for a primary school, and more for a secondary school. Mr Gove also addressed concerns that such small schools, set up by like-minded people, could become pockets of extremism or fundamentalism. He promised that "extremist groups will not be allowed anywhere near public money". There are some other big questions linked to the wider pressures on public spending. How will such an expansion in schools be funded? It will mean paying for new teachers and equipping buildings, while still maintaining the existing school system. Mr Gove has promised that this will not mean cutting per pupil spending - and it will not mean taking resources from existing schools. He also rejects as flawed the idea that opening a new, innovative school will damage other local schools. The implication of this is that extra money - in large quantities - will be made available for free schools. And when cuts are being made to education budgets, there will be questions about where this money will be found - and what might be cut to pay for it. There are also some delicate political sensitivities for the education secretary to negotiate. The Liberal Democrats, who heaped scorn on free schools during the election, will be expecting large sums to be spent on their own pupil premium policy to support poorer pupils. Since both free schools and the pupil premium are now being aimed at raising achievement in disadvantaged areas, there could be some interesting attempts to weave together spending plans. Another thorny area for the newly-launched free school project will be the relationship between publicly-funded free schools and private companies who might want to manage them for a fee. The idea has been promoted as giving new freedoms to highly-motivated groups of parents, ambitious teachers and educational philanthropists. Converting free schools into an outsourcing operation would take off much of the idealistic gloss. If there are still questions about the character of these new schools, Mr Gove's argument would be that this is entirely the point. It's up to the innovation of whoever launches a school to decide its ethos - and it shouldn't be pre-determined by government. Free schools have left the drawing board, but the final product has still to be road-tested.